An irritated and irrational bar hopper went on a more than 16-minute long tirade against a black Lyft driver – taunting him, lobbing racial slurs and accusing him of being “racist against gay people” – for refusing to allow him to play music in the car. The ordeal was captured on video, which has since gone viral, with people overwhelmingly siding with the driver. 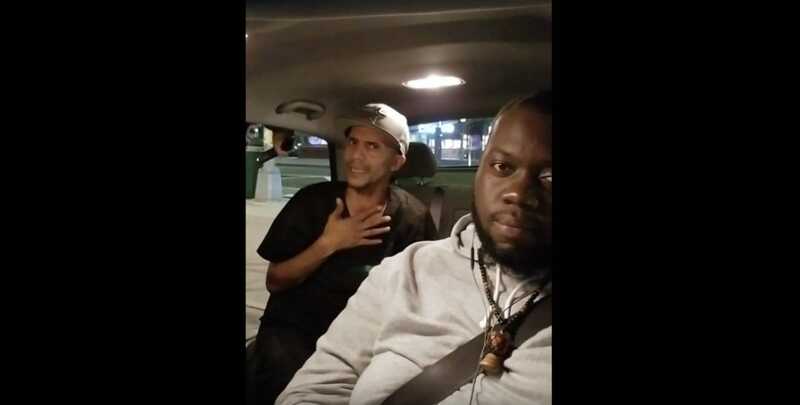 “I feel racially profiled,” passenger Robert Ortiz tells Lyft driver, Shawn Pepas Lettman, in the video recording. Ortiz is accompanied by two friends, who also can be seen and heard harassing Lettman, a driver based out of Brooklyn, N.Y. As the video progresses, Ortiz, a self-identified Trump-supporter openly (and profanely) disparaged Black Lives Matter, practically unravels as he makes several phone calls to the police department, a friend and to Lyft to complain about discriminatory treatment. Lettman shows an unreal calmness throughout the video as he looks expressionless into the camera. “The n*$%&’s recording me without my consent, because I asked for music,” Ortiz continues. The video doesn’t show the initial argument, when the men requested their choice in music. Lettman picked up the men from a gay club and once Ortiz called the police and realized he was being recorded, he grew increasingly angry, threatening to sue the Lyft driver for allegedly recording him illegally. However, New York is a one-party consent state. This means that it is actually legal to make a recording of this nature as long as one person consents to the recording. In this case, that would be Lettman. He also states, in his only remark in the video, that there is signage in the car saying that a camera is recording inside the vehicle. Considering that this was a share ride in Lettman’s car, it seems that Lettman was within his rights to record. “As a father of 2 my single means of providing for my wife and children is driving a rideshare, accommodating people from all walks of life, All of which I treat with the utmost respect, after all I must provide for my family,” Lettman continued. As of Thursday afternoon, Lettman’s GoFundMe post, entitled “Insulted but not broken,” was shared more than 12,000 times and has raised $25,695 – surpassing Lettman’s initial target by more than $5,000. He updated his post on Oct. 7th, thanking everyone for the donations that he said would “assist me in catching up on expenses such as rent and car payments” before suggesting the money would also be used in the event he is sued by Ortiz. Fortunately, according to an update on Lettman’s post, despite an initial suspension by Lyft, he was reinstated by the company and is driving once again. As for Ortiz, Instinct Magazine reports he lost his job at CityMD after the video was posted. He also received a deluge of phone calls on his personal phone and was apparently forced to change his number.